Page 82 of the first of Teresa Vanderburgh's Musical Scrapbooks - concert programs and newspaper clippings. 1894. Concert programs included are for a performance at the Merritton Town Hall, and two separate performances at the Collegiate Hall. 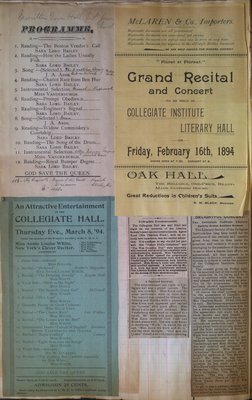 Newspaper clippings contain reviews for performances at the Collegiate Hall.